Afghanistan is a nasty, dangerous place. When a journalist covering that war, I'm hounded by the thought, "I could be torn to shreds any second." Several weeks ago at the Woodstock Film Festival watching The Tiger Next Door, it occurred to me, "I could be torn to shreds any second in America." At the center of this excellent documentary is Dennis Hill. Stringy long white hair and beard, open and engaging personality, determined and dedicated to pursue his peculiar occupation. Peculiar what? Dennis has living in his backyard 24 tigers, 3 bears, 6 leopards, one cougar and other assorted wild beasts. 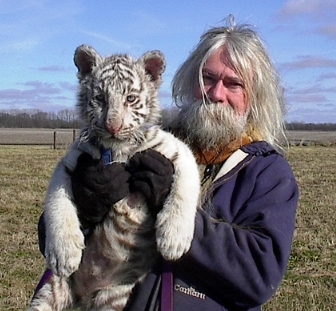 A breeder of large felines (until recently licensed by the USDA), he is especially obsessed to breed a stripeless white tiger, which, not incidentally, could fetch the perpetually impoverished Dennis as much as $150,000. There is, however, a problem. The Indiana Department of Natural Resources conducts a surprise inspection of his Flat Rock, Indiana backyard operation and slaps Dennis with numerous violations that range from cages not locked to stagnant water in drinking bowls. He is ordered to reduce his wild animals to only three -- and within one month! Although Dennis hopes to get some of his animals back, to keep any he must find homes for nearly all of his over 30 wild animals. The Tiger Next Door chronicles Dennis' desperate attempt to place his animals with other breeders while the film also addresses whether Dennis Hill should be allowed to breed these dangerous wild animals in his backyard. By focusing on this particular case in Indiana, the documentary highlights what has become a growing national problem: caging of dangerous animals on private property under unsatisfactory conditions. A growing problem that has even spread to a neighborhood near my apartment -- in the middle of New York City! 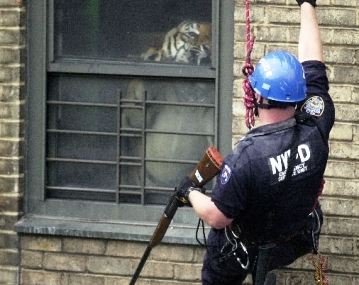 Experts estimate, according to the film, more tigers are now living in cages in the United States than are roaming wild in the world. And that's not counting the two legged ones. Filmmaker Camilla Calamandrei moves swiftly through a cast of people who support Dennis and those who oppose his backyard facility. This includes neighbors and government authorities, family members and animal-rights activists. While some make sense, others make less sense. Many are strongly loyal to Dennis, yet one individual appears bent on not only ending Dennis' operation, but destroying Dennis. This tapestry of opinion moves us inside a community in conflict over an emotional issue. Calamandrei expresses her views without polemics, thankfully. She's fair and we know where she stands. So, is Dennis Hill a nut case for boarding people-eating cats in his backyard? Or is Dennis merely a genuine individualist doing his thing? Maybe an eccentric during a time when eccentrics are no longer tolerated? The issue is not whether Dennis Hill loves his wild animals, since he clearly does -- although not necessarily in a healthy way. The issue is can he adequately care for these dangerous animals and ensure they will not become a threat to the community? Or maybe the question is why should we take a risk with his homespun, underfunded operation? The Tiger Next Door is made beautifully and challenges thinking adults -- the cinematography is flawless, the narration is informative without dominating, the narrative is seamless. The Tiger Next Door does what good documentaries do: illuminate an important subject that is under the radar screen, deliver solid information and a diversity of opinions, and leave viewers informed and concerned about a serious issue. And in this case, a serious one that is quickly becoming a crisis. Recently in Pennsylvania a woman was killed by a bear when cleaning its cage ... in Connecticut a woman was mauled by her friend's 200 pound pet chimp ... in California -- well, just read the paper and you'll know where the next tragedy strikes. First, however, you might want to check out who is actually living next door. Half of the fifty States, we are told, allow residents to own tigers without any special qualifications. Does yours? And where this excellent film ends is where activism needs to begin. Two organizations in the thick of the battle, Born Free and Humane Society of the United States, are pressing states and the federal government to closely monitor and strictly regulate wild animal ownership. Check them out, before a tiger checks you out. The Tiger Next Door will be shown this Friday, November 13 at 8:00 PM, in New York City at the 33rd Margret Mead Film and Video Festival, held at the American Museum of Natural History.